[Jesus said,] "If you love me, obey my commandments. 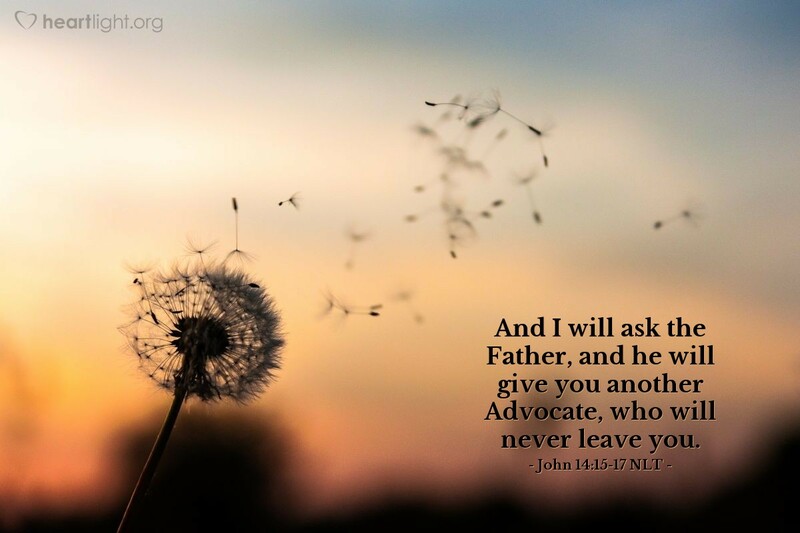 And I will ask the Father, and he will give you another Advocate, who will never leave you. He is the Holy Spirit, who leads into all truth. The world cannot receive him, because it isn't looking for him and doesn't recognize him. But you know him, because he lives with you now and later will be in you." It is so hard to adequately translate the term Jesus uses for the Holy Spirit in John 14. Translators make several different choices — Helper, Advocate, Counselor, and Comforter. Some transliterate the original Greek word and use Paraklete. How we translate the word is not nearly as important as our understanding of the Holy Spirit's presence in Jesus' disciples. The abiding presence of the Holy Spirit is one of the most crucial and distinguishing characteristics of a Christian. The world cannot recognize the Spirit's presence, much less receive the Holy Spirit's abiding presence. As Christians, however, we are given the Holy Spirit as a gift when we are saved. The Spirit makes us pure and holy and then lives inside us, making us God's holy temple. What's more, the Spirit's presence is lasting! He won't leave us! Father and LORD, you are the holy and righteous God. Your majesty and might are incomparable. But, dear Father, I am a sinner. I have fallen short of your holy standards. I am not worthy to enter your presence. So I thank you today, knowing that your Spirit, my Comforter and Counselor, has purified me and now dwells inside me. By the power of your abiding presence, the Holy Spirit, transform me to be like Jesus, in whose name I pray. Amen.